Note: This review, originally an assignment set by my MA tutor at Central Saint Martins School of Art in 1995, helped me land a Pass with Distinction, and is still considered my best work from that time. Today, in tribute to David Bowie – who died yesterday morning (10th January 2016) – I share it, unabridged, for your reading pleasure. Having read the reviews of the American leg of his Outside tour, I expected David Bowie to be clad in blazing Rock Star silver. So his selected outfit for Wednesday’s concert at Wembley Arena – his first in Britain for five years – was a surprise. The former Thin White Duke emerged dressed in an artfully stained, crumpled top and trousers that matched the drapes of the masked dummies hanging on the ceiling, and did not change once. The antithesis of Bowie’s impeccable dress sense, the subdued choice turned out to be deliberate. In it Bowie was able to slide into various character roles as each new song came on – a fiercely sensual Minotaur, a pensive ‘art-crime’ detective, a contemptuous Andy Warhol – with the ease of a mime artist, concentrating his portrayals to the upper part of his body. By the concert’s end, I was left reeling from a virtual resurrection of the old chameleon resplendent in Technicolor. Support act Morrissey, who preceded him, displayed characteristic ardour in sampling his new album, Southpaw Grammar, lunging repeatedly at an illusory opponent to the strains of Dagenham Dave and narcissistically stroking a bare, fleshy chest to cheers from a half-full Arena. However, not even an impromptu kiss of the hand from a kneeling fan could raise the temperature like Morrissey’s professed hero could. As soon as the backing band opened the concert proper with the soulful Motel, the whole crowd stood up like a thousand rows of luxurious glam-rock eyelashes opening in anticipation. 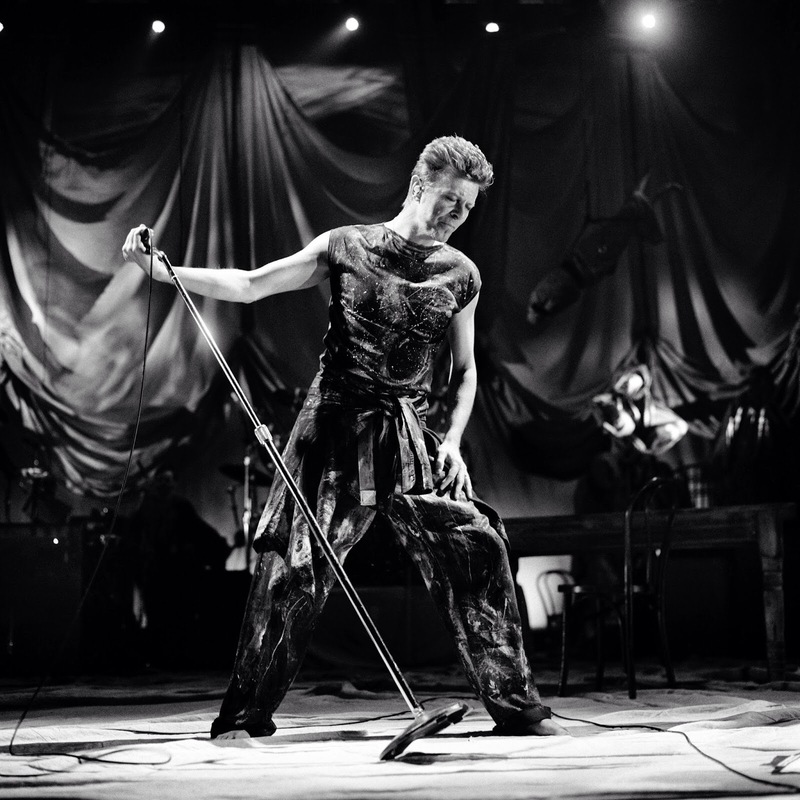 Curiously restrained after Morrissey’s foppish excesses though he seemed, Bowie moved with more panache. He struck precise triangular poses with one foot stretched back, the microphone stand leaning inwards to meet his refined profile. To some unearthly notes, he mimed – beautifully – a bird cruising in slow motion. As Andy Warhol, he stood with his back to the audience, every now and then repeating a haughty half-turn with hand on chin, and then twitched and shook under a flashing solarium light before letting out a silent scream. A highly developed and futuristic concept places Outside in 1999, centring round an ‘art-crime’ detective, Nathan Adler, and his investigation into the murder of 14-year-old Baby Grace Blue. Gruesome as certain details sound – apparently the victim’s “stomach was carefully flapped open and the intentines removed, disentangle and re-knitted…into a small web” – the story does give Bowie’s band a far more definite idea of how Outside should be played. In preparation for the recording of Outside, Bowie’s long-time collaborator, Brian Eno, is said to have handed out cards instructing stuff like: “You are about the encounter such a scene of utter destruction that can happen to any human body that you view it as a thing of beauty” to individual band members. Pretentious? Perhaps. Then again, who else would risk artistic integrity for the sake of such stirring avant-garde music? Satirical? Probably. Could you honestly take seriously Adler’s reflection on Baby Grace’s death that “it was murder…but was it art?”? Art, design and media is increasingly resorting to apocalyptic means as we near the end of the 20th century – be it a McQueen frock, a Tarantino film or a Hirst shark. Outside is meant to be a satire of our times, a means of illustrating Bowie’s concern about where all this is heading. Outside re-embraces Bowie’s androgynous chameleon-like persona. The new album is strongly reminiscent of Diamond Dogs, his stylishly apocalyptic 1974 offering, and indeed, the stage is framed with hanging cinema signs announcing ‘Open the Dog’ in French and English. Other old favourites – among them Andy Warhol, which originally appeared on 1972’s Hunky Dory album – Under Pressure and the immortal Man Who Sold the World were also played out to souped-up tunes. Watching a deliciously hallucinatory recital of The Man Who… I even imagined for a minute that I was viewing a Space Oddity. “Oh no, not me/I never lost control/You’re face to face/With the man who sold the world,” the familiar transatlantic voice warbled, as an awesome sequence of solarium lights flashed, swooped and swerved in Close Encounters of the Third Kind-like chorus. One main difference materialises between Bowie then and Bowie now. He is make-up free except for the dark eyeshadow encircling those freakish eyes. The physique, once skeletal, is compact and hints at musculature. He might be playing different characters, but instead of dressing up as them he leaves their physical appearances in his computer. Baby Grace, Detective Adler and the Minotaur appear in the accompanying tour catalogue and on the album sleeve, their faces morphed from visages of people who fit the archetype and Bowie’s own. Since Scary Monsters in 1980, Outside marks Bowie’s return to his aesthetic best. (Hugely popular though it was, Let’s Dance in 1983 ultimately compromised Bowie’s creativity, consequently becoming the beginning of a new low: Bowie fell out of tune with Mars and risked turning into just another coke’d out rock dinosaur struggling to recapture his lost youth. The singer has said that the Let’s Dance era was one he would rather forget.) He evidently relishes performing, and the result is an exhilarating piece of theatre. All of Bowie’s collaborations with Eno have met with cultish acclaim before, particularly Low and Heroes, both of which cemented Bowie’s status as a far-reaching avant-garde rock musician. If plans go accordingly and Outside becomes the prelude to a trilogy, prepare for your senses to be sent reeling once again to another planet.